﻿Nelson Mandela International Day: Calendar, History, Tweets, Facts, Quotes & Activities. Nelson Mandela Day seeks to celebrate the political and social achievements of former South African President Nelson Mandela. Mandela, who spent three decades in prison for his political activism, became the first black president of the Republic of South Africa in 1994. His presidency ended the long-standing apartheid in which whites ruled over blacks and saw the birth of democracy and equality among all citizens. He was also active in combatting poverty, encouraging land reform, expanding health services, supporting education and setting an example of peace, anti-racism and human rights adherence for other nations. 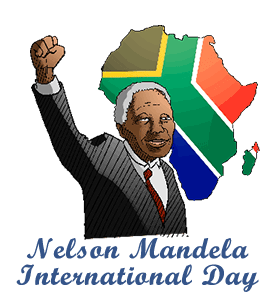 Nelson Mandela International Day was designated by the United Nations and the Nelson Mandela Foundation in 2009. It is celebrated on Mandela's birthday, July 18th, in an effort to recognize the impact of Mandela's values and his contribution to humanity. Mandela passed away in December of 2013 at the age of 95. Nelson Mandela had six children. Nelson Mandela has received several awards including the Nobel Peace Prize in 1993, the Bailiff Grand Cross of the Order of St. John and the Order of Merit from the Queen Elizabeth II and the Order of Canada. When Nelson Mandela was born his name was Rolihlalala Mandela, which meant, to pull a branch off a tree and trouble maker. He was given the name Nelson in school when he was seven years old. Nelson Mandela was sentenced to life in prison and ended up spending over 27 years in prison. He was eventually released from prison due to secret talks he had with the president of South Africa at the time, F.W. de Klerk. Devote 67 minutes of your day to helping others (volunteering, helping mom, cleaning, etc.). For 67 years, Nelson Mandela fought for humanity and on every July 18th, Mandela's birthday, the UN and the NMF ask citizens of the world to devote 67 minutes of time to helping others. Watch one of the movies detailing the life of Nelson Mandela or apartheid. Some suggestions are: Mandela: Long Walk to Freedom (2013), Invictus (2009), and Mandela and de Klerk (1997). Nominate someone or an organization that you think serves every day. If you think they make a positive change in your community you can nominate those you think deserve acknowledgement as a Madiba Change Maker by sharing their stories on social media with the hashtag #Time2Serve. Spread awareness by using the hashtags #NelsonMandelaInternationalDay, #MandelaDay and #mandela. Research South African history to gain a better understanding of how the apartheid system came about, what it entailed and learn more about the segregation in the country. Books such as The History of South Africa and South African History shed light on the colonial periods and the beginning of state-run segregation.